The fact that the Pittsburgh Pirates have had a rough run since the conclusion of the 1992 NLCS is well-chronicled. But despite this decade and a half of less-than-spectacular baseball, fans continue to flock to PNC Park. Yes, there are certainly reasons other than the product on the field, but we're pretty sure that all 2,527,968 people didn't come to a Pirate game strictly for the fireworks last year. You have to admit that there a number of truly die-hard Bucco supporters. And we're trying to find them. We're looking for the people who show up year after year sporting the jersey of the current face of the team, be it Jason Bay or Jason Kendall; the fans who don't know the meaning of the word "apathy"; the fans that have invested thousands of dollars in decorating their game room in Pirate memorabilia; the fans that continue to wonder if this is the year. We want to hear their stories. With that in mind, it's time to introduce the world to what we hope will be our most interesting contest ever: we're looking for the World's Biggest Pittsburgh Pirate Fan. --Make your case in as many or as few words as possible. Photos are encouraged but not necessary. --We will post (10) finalists chosen internally by May 1, 2008. The 10 finalists' stories and pictures will be up for vote by the public, with the winner officially announced on Monday, May 12th, 2008. *A 20x23" lithograph featuring the authentic signatures of Hall of Famer Willie Stargell and artist Rich Marks. 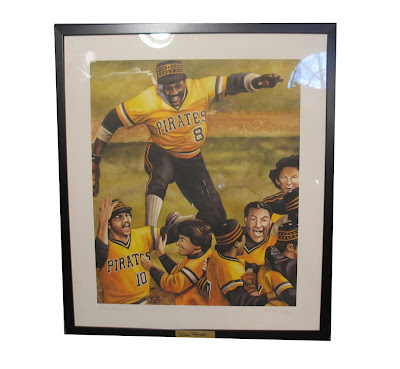 This beautiful lithograph, a limited edition #2244/4000, features an authentic autograph from WILLIE STARGELL. It has also been signed by artist RICH MARKS. The final size is a huge 20x23", and it is professionally framed and matted. 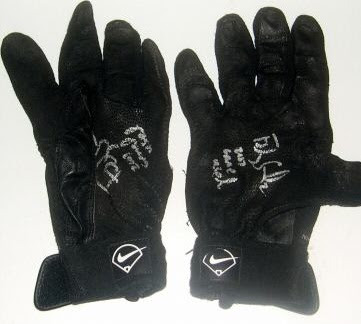 Please visit steelcityauctions.com for additional rules and directions on submitting your entry.